Villa Kiri is a vacation residence with a stadium orientation – the main structures are built along the borders of the rectangular property to create a focal point for the villa’s main attraction or feature. Appointments, furnishings and interiors are well-coordinated following the predominant color scheme of contrasting dark and warm elements and hues. 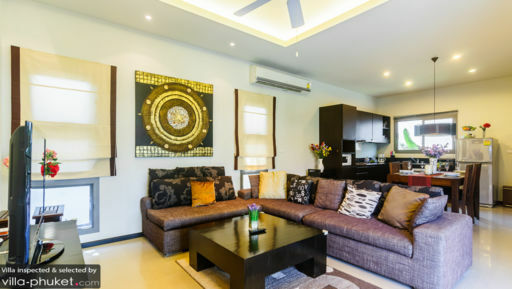 Truly, Villa Kiri was designed for your utmost enjoyment and comfort. The villa has three bedrooms. Two are at the main villa. One is housed in the separate unit at the other side of the swimming pool. All bedrooms have king-sized beds and dedicated bathrooms. Surrounded by the main villa and a separate unit is the eight-meter swimming pool. Right at the center of the villa, its clear, cool and inviting waters are directly accessible to you wherever you may be. Jump in. Go for a soothing dip. Carelessly wade, float or splash about. Up on the wood-decked covered terrace, you can lazily lounge on one the folding pool beds, on the cushioned wooden bench or at the wooden table as you sip a refreshing drink. From the swimming pool and the covered terrace through sliding glass doors is the living area. Here, you all can gather to catch the latest episode of the latest hit TV series. Right behind is the dining area with its wooden dining table that can accommodate up to six. Here, you can show off your culinary expertise as you dish out specialties which you yourself prepared at the kitchen set up by the nearby wall. In charge of the villa’s maintenance and upkeep is a housekeeper, a pool attendant and a gardener. Security personnel are regularly on duty. 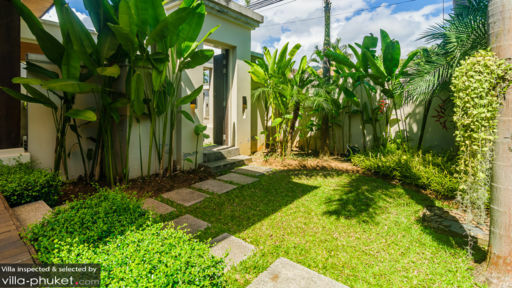 Villa Kiri is located within the vicinity of Nai Harn - a white-sand, swimming beach. From here, you can go on board a traditional Long-Tail Boat and explore the nearby islands of Ko Bon, Ko Kaew, Ko Lon, Ko Aeo and Ko Hae – which is also known as Coral Island. Back at Nai Harn, get to sample and savor really delicious seafood at Sala Loi where you can also get to experience dining the traditional way – from a mat on the floor. Make sure to schedule a visit to the Phuket Shell Museum and to Promthep Cape View Point to catch the spectacular sunset. The staff is friendly and very accommodating, and they have a pretty good room service menu with more than fair prices. 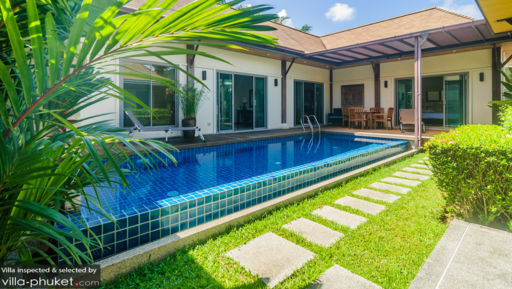 It's convenient, and private (wink/nod) to have your own pool in your villa and your own kitchen. The Bathroom is spacious and the shower/tub have ample room for two. The Villas have a free shuttle service that runs locally to the nearby shopping center, and they can get you rental cars/motorbikes as you need/want them pretty handily. We loved our stay at the Kiri Villas!! We stayed in Canal 7 - two bedrooms, private pool, and patio. Our villa was immaculate and the staff super friendly! As another reviewer mentioned, the complex is a bit off the beaten path - but not so much that you can’t arrange for a taxi/car to get you to where you need to be. Additionally, if need be you can work with the front desk to arrange a car/driver for 3hrs at really reasonable prices. Also, getting to fine restaurants like Toto is easy as there’s a free bus service that can be arranged to pick you up and bring you to the restaurant. Highly recommend Kiri Villas!! If you're looking for a cozy little villa in an isolated, quiet street, you'll love Kiri Villas. We stayed in Canal 1, which is a one bedroom apartment with a private pool. It had a gorgeous, cabin-esque vibe with a stellar patio. If you're happy being away from the town centre, this would be an ideal spot.